Stage & Street grew from a home business. As a well known and highly accomplished seamstress and designer, Evelyn Davie was called upon to rescue a local dance school in need of costumes for a production. Although Evelyn had been involved with theatre costuming for years, this opened the door to the world of dance, and the desperate need for supplies in northern Ontario. Evelyn became familiar with the frustration of obtaining dance supplies when her daughter began classes. It was not only difficult to acquire clothing and shoes, but completing costumes for performances was near impossible. The decision was then made to combine her theatre, sewing, and business skills to open a retail store in order to serve the needs of dancers and actors. Many of Stage & Street’s patrons have been visiting and doing business with the store for years, even decades. It continues to be a pleasure to assist everyone with their purchases and projects. 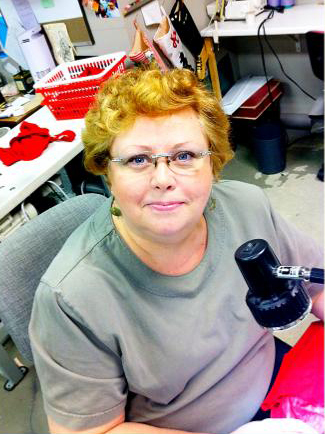 Evelyn takes great pride in knowing and assisting generations of dance and custom sewing clients. A great deal of studying and research has been taken to provide customers with quality products. Evelyn’s understanding of textiles, line, design, purpose and construction provide her with a unique, one-of-a-kind skill set. These strengths have allowed her to expand and delve into the clothing needs of other sports such as skating, synchronized swimming, cross country skiing, belly dancing, ballroom dancing and body building. Through Stage & Street, Evelyn and her team have received hundreds of awards for their custom costume designs and creations. Evelyn is always thrilled to support performers in this way.